This variety was created by one of the University of California breeding programs. I got interested in this tree, when I got reports that it was growing well in Texas. I felt it is worth a shot to grow it in South Florida. It does not seem to have popularity as a commercial variety. A tree will be top worked probably in January 2014. March 7, 2014: I could not get decent bud wood until now. Seems to be late flowering in So. Florida. A tree has been top worked. March 3, 2015: The tree is growing well. There are some open flowers and some more coming. Can see some BB size fruit in the top. May 30, 2015: The tree is growing well it is compact and small. Did set a lot of fruit for its first flowering. August 25, 2015: For a while the fruit looked like it had stopped growing but now seems like it dropped some and what is on the tree looks decent. Definitely bigger than the regular Hass I have growing. Fruit is clean, the tree looks good. September 19, 2015: The fruit on the tree is growing slowly, looks clean and the tree can protect it well from the sun. Some if the fruit look bigger than a large Hass. In some places it indicates it is a 6-15 oz fruit and that it ripens from April to August. Here nothing gets past February so we'll see. November 11, 2015: Stopped by the tree today. The fruit keeps getting larger, have to be close to 12 oz fruit. Good sign, no fruit drop either. A good amount on the tree. November 18, 2015: Keep coming back to this tree, the fruit is sizing up better, seems like there is more fruit and holding it. The fruit looks bright so is has some more to go. Another 6 weeks would be great.These fruits all look over 12 oz for sure, so they are in the normal range, I see no dwarfism, all nice, clean and about the same size. November 23, 2015: Returned to the tree to pick a fruit to weight and do a dry weight test to see. 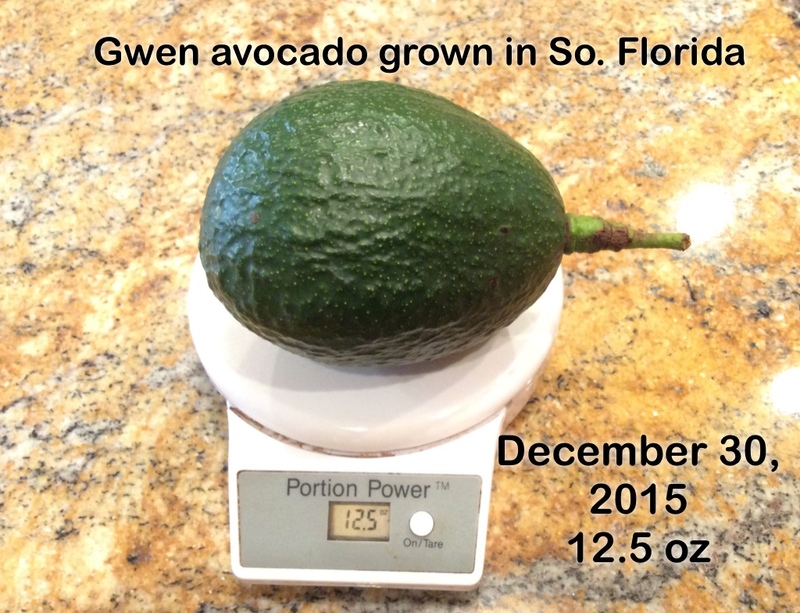 The fruit came in at 13.2 oz, small seed, better size than the store bought 3th rate 5-6 oz Hass we get around here. After the dry weight check, I will decide if I pick one to let it ripen or just wait some more. Dry weight came in at 16.15% this leads me to believe it has some more time to go. 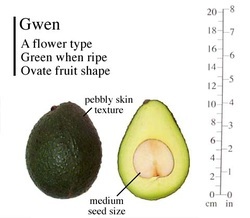 In the University of California Minimum Maturity Standards shows Gwen at 24.2%. It would be interesting to see if this fruit continues to hang on the tree and continue to increase its dry weight over the next few weeks. December 12, 2015: Looking good. The tree is holding all fruit, survived 14 inches or rain in last few days. Even better the fruit seem to be getting bigger probably close to 14 oz. Bright and green. Took some pictures today. December 30, 2015: This tree is finishing the year with high expectations from me. The tree in its first flowering post grafting set a good amount of fruit, it is holding it with no significant fruit drop. That is rare even for the regular late varieties we normally grow. The fruit is a nice size 13-15 oz, great since late fruit is usually large, some very large like Monroe and imported from DR Carla. It is nice to have a small fruit in winter. The fruit looks very clean, resisting some of the typical diseases me have that require the spraying of late fruit 5-6 times. It has a lot of good qualities, I really have no idea when they would be ready. It they can hang to the end of January it would be great. I picked the fruit to the left to see if and how it ripens. If it ripens well I would start taking one a week for dry weight testing. January 28, 2016: The avocado in ttoday's picture did not ripened well, probably I waited too long and this fruit does not over ripen well. The one I opened yesterday ripened to perfection but the taste I did not like, tasteless, no pleasant. Need I add, that a friend who tasted it like it because it was bland. The tree still holding a lot of fruit and could well be a January to February fruit. Having Monroe's and and a few Oro Negros on the trees really makes this tree useless to me. None the less I will monitor it to see how long fruit hold on to. This fruit in in the album with today's date. March 5, 2016: I have tried this fruit several times because it is still hanging on the tree. Great quality since most other fruit is gone by now. The taste is totally worthless, it tastes like nothing I would want to eat. Also some sub-skin issues, similar to other California varieties here. Ending coverage getting rid of it.